This great stylish sofa bed has an easy lift up action so there is no hard work taking off and replacing the cushions on this sofa bed. 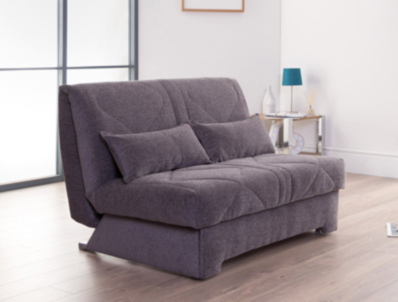 With this sofa bed the sitting/sleeping surface is made with a deep mixed foam block that is approx 10cm deep, this offers great comfort. The Aztec is great for a smaller room as there are no arms on the sofa bed, making the external size much smaller than traditional styles. The sofa bed is available in 3 sizes and a new range of puccini fabrics, including a new B Range and an updated A range of fabrics. All sizes are available with the option of bolster cushions if required. There is a wide range of fabrics available for the sofa bed and if you would like we can send you some samples to help your with your choice.